You are here: Home / Jobs / Will I Get the Job I Want If I Wear My Natural Hair? I received my first relaxer at eight years old. I was fortunately blessed with thick curly hair, but to my mom’s misfortune, my rambunctious, stubborn hair was extremely difficult to maintain. Therefore, she did what essentially every black mom was doing in the nineties, and she got me my first relaxer. I for one was immensely overjoyed. Although I grew up in Jamaica where the majority of my peers looked just like me and shared similar coiled hair textures, our beauty standards were very much influenced by what we saw on TV, white women with straight hair. Therefore, at the age of eight I was elated to finally share what I believed was a similarity to Mary-Kate and Ashley Olsen and Sabrina the Teenage Witch. Throughout my teens, even as my hair became brittle from chemical damage, I still held on to this beauty standard as superior and when I relocated to the US and began my adult journey into the professional world, I saw this beauty standard as a necessity. I can’t count the number of times that I’ve been told that natural hair is unacceptable in the workplace, that it’s a no-go for interviews and a guaranteed road block to receiving a job offer and now as I sit in my professional career, I wish I could say without pause that this isn’t true. But the truth is that this is a reality in many work settings and especially so in a conservative law firm. So how does one maneuver this reality? Must we simply accept that this is how it is or should we put our foot down in defiance and risk missing out on prolific career opportunities? To be honest with you, I don’t know. I’ve gone out of my way to install a straight textured weave before my first day at a job so that everyone around me would be comfortable. However, I’m now at a job where I wear my natural hair comfortably and with pride each day. So what will happen if you decide to cancel your relaxer appointment before the next round of on campus interviews? There’s no clear answer to this conundrum but hopefully some background on this issue and some factors to keep in mind, will help you to arrive at a decision. Why Is Natural Hair Such a Provocative Issue? Before a job interview, the typical concern is whether one will be prepared to answer the complex questions thrown at them. 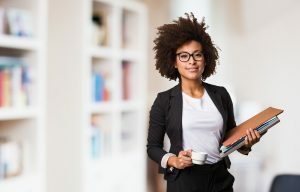 Black women however, have an added layer of concern which, prior to an interview, has certainly made it through several messages to an affinity group or throughout conversations with close peers – “should I wear my natural hair?” This question stems from our valid concern of employer discrimination either at the interview stage or within the workplace. Employers have been able to successfully discriminate against black women in the workplace through instituting “race neutral grooming policies” which they claim provides strict policies for an employee’s hair style vs hair texture. A federal appeals court has held that a hair style is not an immutable characteristic whereas hair texture is. Therefore, a hairstyle is not afforded Title VII protection and an employer’s grooming policy that bans popular black natural hairstyles such as dreadlocks, is not discriminatory. These policies however, fail to recognize the interconnected nature of hair styles and hair texture for black women. The acceptable hair styles within grooming policies tend to pinpoint straight hair friendly styles as the standard for professionalism and fail to recognize the fact that black employees with a natural curl or coiled hair texture, would have to rely on harsh chemicals or damaging heat to manipulate their hair and fulfill said professional standard. Therefore, a black woman would almost always have to alter her hair texture in some way (i.e. through relaxers, chemicals, straighteners etc.) to maintain a compliant hairstyle. Although hair texture is recognized as an immutable characteristic, black women are essentially forced to change it either through policy or corporate culture to stay in line. This has unfortunately become the norm, which allows this discrimination to persist. Therefore, to answer this question, natural hair is provocative because it could cost you a job. So Should We Do Something About it or Just Give in to Get Ahead? Typically, I would never suggest giving in to a norm which allows for continued discrimination against a minority group, and I also won’t suggest giving in here. However, I do understand how difficult it is to get into a conservative legal career and as someone who has “given in” before, I also understand the temptation of assimilating to get one’s foot in the door. Before deciding on what to do about your hair, I propose assessing what you want out of your career and if that path pushes you towards “giving in” then determine how you will make an impact in changing “de facto” discriminatory guidelines. Assessing what you want out of your career before you’ve even started is not an easy feat. However, knowing what you want out of your career may make your decision much easier. If you know you don’t want to work in a law firm environment, then this issue may be less of a concern. However, if you do want to work in a more conservative setting, the question may be, are you willing to work for an employer who causes you to change an immutable characteristic? At the start of your career, you may have very limited options but if it’s important to you to not sway, I recommend resisting the urge to give in now. Having the courage to be vulnerable will be tough, and it won’t make your job search much easier, but if you maintain your conviction, you will find an employer that won’t ask you to change who you are to fit in to their environment. 2. Will You Make an Impact Within Your Sphere of Influence? If you do give in, don’t feel like you’ve sold out. Getting past this barrier is extremely difficult, and it may take years before natural hair is broadly accepted as a norm in corporate America. However, as someone on the inside, this may be an opportunity to use your sphere of influence to make a change. Employers may have strict grooming guidelines in place due to a lack of understanding of the different hair types of a diverse workforce. You however, have the opportunity to normalize this. So use this opportunity to make an impact. Whatever you decide, I’m sure your “black girl magic,” will chart you on the right course!